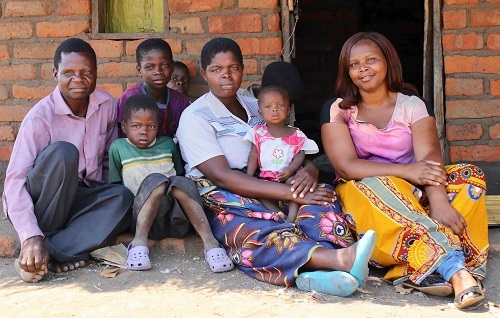 Ellena Sosteni and her family at their home in Kwitanda, Malawi, with Patience Tchongwe (far right), CCPF Hotline Supervisor. Ellena Sosteni is a 31-one-year-old mother of five who lives in a rural village in the Balaka district of Malawi. With the nearest health facility several kilometers away, Ellena and her family must walk about 2 hours to access basic health care services. While visiting a village clinic, Ellena learned about Chipatala Cha Pa Foni (CCPF), or Health Center by Phone, from a community health worker. CCPF is a toll-free health hotline and message service in Malawi. CCPF creates a critical link between the health center and remote communities, increasing access to health information and care where it’s needed most. After several weeks of persistent headache and feeling lethargic, Ellena decided to call CCPF. The hotline worker advised Ellena to consult a doctor to explore the possibility of pregnancy and to rule out malaria. Elena visited the health facility three days after calling CCPF where her pregnancy was confirmed. Upon finding out she was pregnant, Ellena called CCPF again where she received advice on the importance of antenatal care, proper nutrition and the effects of hormonal changes during pregnancy. 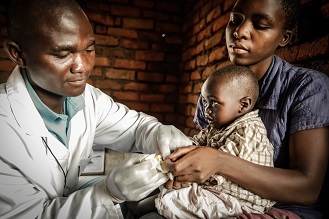 In rural communities like Balaka, where getting to a health center is difficult, people often delay seeking care. For pregnant women, this can mean a delay in critical antenatal care and access to preventive measures that are important to the health of both mother and baby. Elena is very grateful for CCPF because it helped her to start antenatal care within the recommended first trimester, care that she did not receive during her previous four pregnancies. Elena is very grateful for CCPF because it helped her to start antenatal care within the recommended first trimester, care that she did not receive during her previous four pregnancies. During her first visit, she underwent an HIV test and received iron supplements, important preventive care measures, especially in the early months of pregnancy. After learning of her pregnancy, Ellena signed up for CCPF’s Tips and Reminders, a mobile message service that provides regular text or voice messages on reproductive, maternal, and newborn health topics. Messages are tailored to the client’s week of pregnancy or a child’s age. The CCPF Tips and Reminders service informed Ellena about many things she wasn’t aware of with her previous pregnancies like body changes, WASH, birth preparedness and the importance of hospital delivery attended by skilled health professionals. “This time, when I started to feel back pain, I remembered the advice from CCPF to rest and relax until the pain passed,” said Ellena. After delivery, she also registered her child with the service to receive regular reminder messages on a wide range of maternal and child health topics including immunizations, growth milestones and breast feeding. Ellena believes her newborn daughter Gloria was healthier and happier because of the information she received through CCPF. Ellena appreciates CCPF because it allows her to access health information from the comfort of her home and gain knowledge about routine maternal and child health care that she and other mothers in her village may not have access to outside of visiting the health center. Ellena is now a CCPF advocate in her area, sharing the information she learns through CCPF and encouraging others to sign up. Through her phone, five more women have registered for CCPF Tips and Reminders Service for their children. The idea for CCPF was originally generated from the local community through a national campaign to develop innovations for maternal and child health. With support from mobile carrier Airtel, the Malawi Ministry of Health and many other partners, CCPF has expanded to cover all general health topics, and is on track to scale-up nationally by 2018. When scale-up is complete, CCPF will be the first, government-run national health hotline in Africa.